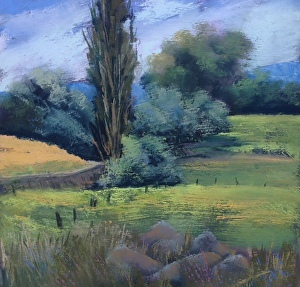 I am a landscape artist who works in pastels, oils and acrylics. My work focuses on representational studies of the western US. I am basically self taught with lots of workshops and studies with several landscape artists such as Bruce Haughey and Clark Elster. I live in southwestern Idaho, am a native Montanan with a strong connection to the land. I spend as much time as I can in MT painting as well other parts of the northwest. I appreciate getting out in the field and working plein air because there is nothing like completing a painting in the true light of day and visually not being compromised by the use of a photo. In my work, my goal is to produce a piece of work that draws the viewer into the painting and challenges them to explore the scene; get a sense of the time of day, the temperature, the light or lack of. If I have gotten that viewer to step out of their reality and into that painting and enjoy it, then my work was accomplished as I wished. Quick draw events are fun, frightening, sometimes furiously fast and often rewarding! Many are an hour or two in length which is not a lot of time to execute a painting but easier compared to the 30 minute events. In a 30 minute event there is no time to ponder. You need to have pondered and made choices in the preparation stage! You need a limited palette and a distinct plan of action when the horn blows to begin your work. So goes the story of the popular quick draw at the Miles City Bucking Horse Sale sponsored by the WaterWorks Art Museum held every May as part of the world famous Bucking Horse Sale that brings thousands of spectators to the town of Miles City. Only a few (25 or less) artists participate in the Riverside Park QD at the culmination of the annual parade. The QD is sandwiched in between the parade and the Grand Entry of the sale and horse races and once the 30 minute draw is complete, the artists have 10 minutes to get their piece framed and the live auction of art begins. It’s fast and furious and the crowd is filled with art collectors and spectators. The QD is strategically timed to be certain those spectators can get to all the BHS activities and maximize the crowd attendance for the auction that is a benefit to the WaterWorks Museum and Art Center. This year I lived on the dangerous side…I decided to paint a larger than normal piece, 26×12 vertical pastel. (Most works are less than 16 inches square.) I prepped my paper by gluing it to a foam core board for stability, then selected a very limited palette of pastel sticks. I planned a painting of buffalo from a photo I shot on my way to MT via Yellowstone Park. The day before the event, the preparatory chores were done. (I could have saved a little stress by doing this 3-4 days earlier!). I did numerous pencil sketches arranging my composition, as the photo was a horizontal format and I was painting it as a vertical. In my sketchbook I made lines of quadrants and adjusted the subject to best fit the format of the proposed painting. I “roughed-in” focal points and large shapes to make what I believed to be a good composition. I put all my supplies – selected pastels, 91% alcohol, sponge brush, Workable fixative, wet wipes, paper towels, gloves and framing equipment in my backpack. I had a plan and felt I could make it happen, but knew I would have no time to spare. Before the event started I found a place to paint…in the park’s gazebo where there was some protection from some gusty winds (not helpful when painting is a tall piece!) and a place to sit if one wanted to before and during the event. And I was able to tone my painting with one color – a mix of dry pigment and alcohol before the QD began. Doing an underpainting like this assists one in pastel application by speeding up the process. The QD begins with the sound of an air horn…now it’s time for autopilot. Your colors are laid out and you instinctively apply them, not second guessing your choice. Large masses are painted carefully noting that the values are where you want them. When someone says “you have 15 minutes left, you want to be at least half way thru your painting.) I am, but there is no option to make changes. I stick to my plan. Once the landscape is satisfactory to my eye, I draw in and paint the buffalo. As I put the final touches in the most distant animal, the horn blows signifying the end of the QD. Hands go up (no more pastel to the paper), I am satisfied, pleased to have finished what I had planned and the framing begins. I had hoped to get my piece in the auction so it would be auctioned somewhere in the middle, but I needed all the time allotted to get the framing accomplished, so the painting was in the last spot on the auction docket. Not my favorite spot to be, but as it turned out the auction was a surprise. One know there is not always a predictable outcome to auctions and this one was not an exception. Early pieces were sold from $200-500. Then one sold for about $800 and another for $1700. I saw a couple of pieces of work of popular artists sell for less than I have seen before. Now I begin to have some anxiety. It’s now the time for my piece to go. I hold the painting up and the auction starts. Bids start immediately and I hand the work to one of the guys on the platform to show. Bids continue to be raised and my anxiety lessens. The auctioneer worked his way to $1500 +. I am relieved and happy to have completed a sought after piece of art and for sharing the sale with the museum. So, when the opportunity arises to compete in a quick draw, do it. The key is preparation and planning. Then execute the painting in a confident manner, not second guessing palette and composition. If you are an art collector and someone who appreciates the arts and the process…know what happens for these works to come to be! I am honored to be able to show my work in some of the best galleries in the west. These originals can be seen in Yachats, OR at Earthworks Gallery, The American Art Company in Tacoma, Wa, Dodson’s in Spokane, WA, Pendleton Art and Frame in Pendleton, OR, Valley Bronze in Joseph, OR, Caswell Bronze in Troutdale, OR, Wenaha Gallery in Dayton, WA, Eagle Art Gallery in Eagle, ID, The Depot in Red Lodge, Mt and Moccasin Mountain Art in Lewistown, MT. I am very pleased to work with these galleries who in my opinion, represent their artist well. That is so important to an artist to have a gallery or galleries that promote your work and really try to sell the art pieces. And ones that pay promptly, according to your agreement, when works sell. When you are in these towns and cities, please visit these fine businesses and be prepared to be treated well as a customer too! A recent blog by Carolyn Henderson of Wenaha Gallery was about the plain air work I exhibited at that gallery in December, 2015 Much of the work was done during my residency with the BLM in Escalante, UT. Enjoy the nicely written blog! Some people spend a chunk of their day outside — mountain climbers, builders, hotel doormen, and definitely not least on the list — plein-air painters. A central facet of 19th century French impressionism, plein-air painting is so called because it is done outdoors, in the plain, fresh air, and those artists committed to the method rival U.S. Postal carriers in their approach to rain, snow, sleet, wind and the occasional, much appreciated, sunny day. “There really is nothing like painting outdoors; it makes you a stronger artist, I think,” says Bonnie Griffith, a painter who trilaterally focuses on oil, pastel and encaustic (hot wax) as her mediums of choice. 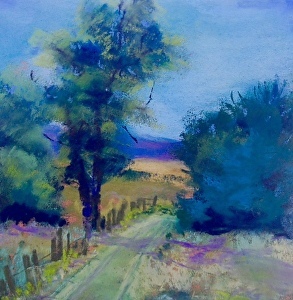 Pastel Dust…Quick Draw/Quick Finish | Bonnie Zahn Griffith – Blog. You get anywhere from 30 minutes to 3 or more hours to complete a piece of art. It is adrenalin producing, energy charged time for the artist and a smorgasbord of art options for the collector. Lots of art centers and other art venues host these as part of their fund raising activities. I love them. I like the challenge and I like the interaction with the collectors! The quick draw usually indicates that the piece of art with be completed in total during the given time frame. The Quick finish is just that…a piece of art is started before the event and then just finished at the event. Sometimes artists will complete the entire work during the quick finish, however. A favorite, challenging quick Draw is the event held in Miles City, MT. where the artist has the challenge of completing a piece of art on 30 minutes that is then auctioned in a live auction in a downtown city park. Another is a more leisure 1 1/2 hour QD at the Festival of Arts at the Joseph, OR that is held in their community center amidst all the art from the festival and with live music and a silent auction of the newly created work. Added to these two great events is a new fave…the Art in the Beartooths to support the Carbon County Art Guild. I was invited to participate in this event this July 11 and it proved to be a grand time. We painted anywhere on the property of the center from 9-2. Your choice of a start from the scratch approach or applying the finishing touches To an already started painting . I decided to paint from beginning to end and with abundant time, it was pretty stress free. This venue, being in the destination spot of Red Lodge, MT is a gem. The setting, in the foothills of the Beartooth Mountains, is inspirational in of itself. The staff was delightful to work with and were most attentive to artists’ needs. The QF culminated with a benefit dinner and live auction under a big tent in the park beside the art center. My creation was done in pastel…I think the only pastel at the event. I decided on painting some favorite things…Creekside willows in the early spring when they are this incredible orange color, still snow on the ground in places and streams running free of ice. I worked about 3 hours on a 24×12 vertical painting that gave me the feeling I wanted to project. I had plenty of time to visit wth old friends, students of mine and new acquaintances. As a result, we are looking at a workshop three next fall (2016) to coincide with the opening of my solo show there opening September 2. And “March Willow” sold well.